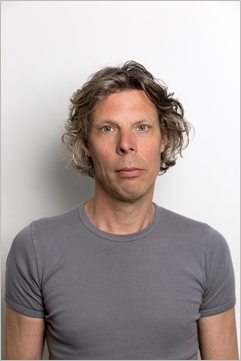 Jeroen van den Berg (1966) is a playwright-director who graduated at the Amsterdam School of Drama in 1993. In 2013, he founded Toneelgroep Jan Vos, together with Tjeerd Bischoff. The company produces site specific theatre productions. Their first production Mansholt, about the EU commissioner of agriculture Sicco Mansholt, was selected for the Dutch Theatre Festival 2014. In the summer of 2018 their play Koning van het Grasland (King of the Meadows) is being performed at farms across the Netherlands. Next winter Toneelgroep Jan Vos presents Tjeerd’s new play GAS, about the exploitation of the biggest European gas field, situated in Groningen. Jeroen was awarded the Drama Encouraging Price of the City of Amsterdam and the Dutch/Flemish Drama Award 2003. His work has been staged in the Netherlands and abroad. He participated in The Lark Theatre’s Playwrights Workshop in New York. He directed plays of Chechov, Pinter and other writers.